Smith & Wesson 627 Performance Center page. Once in a while, the urge overtakes you to have something that is "the best". 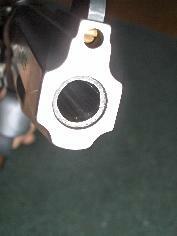 After taking a friend shooting with my Taurus 669 .357 Magnum, it rekindled my interest in the cartridge. The .357 is so versatile, and fun to shoot and there was certainly nothing wrong with the Taurus. My only complaint being the fairly hateful double action trigger pull. I had a discussion with someone about the "crazy" prices of the Smith & Wesson Performance Center guns and I was told to try the 627, that it really was "All that". Another friend expressed interest in my 669 so I used the proceeds toward the 627. I rang up my friend Bernie at www.virginiaarms.com and got a good price. 1: Ok, it feels better, but 4 times the cost of the Taurus better? I was in for a pleasant surprise. The first cylinder went into 2 holes, 5 shots in one whole, 3 in another a bare minimum distance away at 7 yards. When I fired the gun in double action, I finally understood. The effort was just right, the pull was smooth, the let off crisp and consistent. It rapidly took it's place as the priemere revolver in my collection. www.bang-inc.com and they're well worth it. Movies below are me shooting the 627 in ICORE matchs at shooter's paradise in Woodbridge, VA. No wimpy, just barely over 'power factor' loads, these are full strength, 158 grain magnums. Spectators rate them by pucker factor.